HDFC Ergo General Insurance Co. Ltd. is a joint venture between HDFC Ltd., a premier bank in India and Ergo International AG, Munich Re’s insurance entity. With the values of the company being sensitivity, ethics, excellence, and dynamism, the company understands the needs of the customers and pro-actively offers innovative products to prospective buyers while honouring commitments and maintaining transparency in the dealings. The company has won several awards from various organizations over the years. The company offers an array of general insurance products and two-wheeler insurance is one of them. 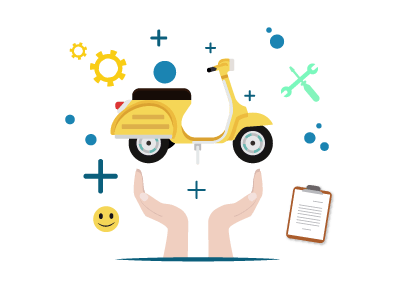 HDFC Ergo offers 2 two-wheeler insurance plans – a comprehensive insurance plan and a multi-year third-party insurance plan. With the vision to become the most admired insurance company by being responsive to the customer’s needs, HDFC Ergo provides excellent customer service. Two-wheeler insurance policyholders who wish to enquire about their policies or wish to register a complaint may call the toll-free number 1800 2700 700. In case of queries with regard to the two wheeler insurance policy, customers can write to corpcomm@hdfcergo.com. However, if a policyholder wishes to reach the claim office, he/she can write to care@hdfcergo.com. LBS Marg, Bhandup (West),Mumbai – 400 078. SP Square, 3rd floor, Park Road, Kurnool – 518001. No. 15/181, 2nd floor, Kavitha Krishna Annexe, Subedarpet Road, Kanamahal Circle, Nellore - 524 001. No. 74-12-6, 3rd floor, Ramalayam Centre, A. V. Rao Road Junction, Rajamundry - 533 103. No. 10-14-575/2, 1st floor, PMR Plaza, V.V.Mahal Road, Tirupati - 517 501. 4th Floor, Seepra Towers, Opposite to HDFC Bank, Behind Airtel office, Bandra Road, Vijaywada - 520 010. 2nd Floor, Potluri Castle, Dwarakanagar, VSP, 16, Vishakapatnam - 530 016. 6th Floor, Adityam building, Lachit Nagar, G.S. Road, Guwahati, Assam – 781 007. 2nd floor, N. K. Heights, Garali, Jorhat – 785 001. 2nd Floor, Om Shanti Complex, Zila School Road, Po- Ramna, Muzaffarpur – 842 002. 1st floor, UMA Complex, Frazer Road, Patna – 800 001. 1st Floor, KH No.730/2, D2 PH No.22, Ward No.30, Rani Laxmi nagar, Near Rama Magneto Mall & IndusInd Bank, Bilaspur – 495 001. 3rd Floor, Chawla Complex, Devender Nagar Road, Sai Nagar, Raipur – 492 001. Delhi Delhi 35, 3rd floor, Central Market Phase-1, Ashok Vihar, Delhi - 110 052. Ground Floor, Ambadeep Building-14, Kasturba Gandhi Marg, New Delhi - 110 001. Unit No. 502, 504, 506, 5th floor, Mahatta Tower, 54, B-1 Block, Community Centre, Janakpuri, New Delhi – 110 058. Ground Floor, Eros Corporate Tower, Opposite Nehru Place Metro Station, Nehru Place, New Delhi – 110 019. Plot No.C-9, 3rd Floor, Pearl Best Heights-II, Netaji Subhash Palace, Pitampura, New Delhi - 110 034. Goa Panjim Unit nos. 1, 2 & 3, 1st Floor, Magnum Centre, M.G. Road, Panjim, Goa - 403 001. 206, 2nd Floor, Shoppers Plaza IV, Opposite BSNL Telephone Exchange Road, Navarangpura, Ahmedabad - 380 006. 1st Floor, Sun Complex, Near CitiBank,Gotri Road, Alkapuri, Vadodara - 390 007. 3rd Floor, Akshat Plaza, 129 Alfa Society, Link Road, Bharuch - 392 001. Office No. 201, 2nd Floor, “Corporate House” Plot no 11/B, Opposite HDFC Bank, Waghawadi road, Bhavnagar, Gujarat – 364 001. 204, Rajkamal 2, 2nd Floor, Plot No.342, Ward - 12/B, Gandhidham – 370 201. 2nd Floor, “Apollo Enclave”, FL 60/61/62, Nr. Modhera Chokdi, Modhera Circle, Mehsana, Gujarat – 384 001. 206-212 Sidhivinayak Complex, Opp Kalyan Jwellers, Dr. Yagnik Road, Rajkot – 360 001. Office No. 207 - 208, B-Wing, 2nd Floor, ICC building, Ring Road, Near Kadiwala School, Surat – 395 002. Shop No. 112, Tirupati Plaza, Sr. No.322/A, Vapi Daman Road, Chala, Vapi – 396 191. Shop No.110 & 117, 1st floor, Om Shubham Tower, Neelam Bata Chowk, NIT, Faridabad - 121 001. Office No.208, 2nd Floor, Sewa Corporate Park, M.G.Road, Gurugram 122 001. SCO 237, 2nd floor, Sector -12, Karnal - 132 001. Himachal Pradesh Shimla A-60, Sarab Complex, Morning Site, Sanjauli, Shimla, Himachal Pradesh – 171 001. 1st floor, 109, South Block, Bahu Plaza, Jammu - 180 012. 2nd Floor, Chinar Comercial Complex, Residency Road, Srinagar – 190 001. 2nd flr, Ozone Plaza, Unit 217, Bank Road, Dhanbad – 826001. Upper Ground Floor, Gayatri Enclave, Jamshedpur - 831 001. Crosswindz, 6th floor, 41 Court road, Ranchi - 834 001. No. 25/1, 2nd Floor, Building No. 2, Shankarnarayana Building, MG Road, Bengaluru - 560 001. No. 2/1-1, 2nd Floor, 11th Main Road, 3rd Block, Oposite. Jayanagar Club, Bengaluru 560 011. 1st flr, Opp. Golgumbaz, Station Road, Bijapur – 586104. 2nd floor, 101/A/SF2, Kishan Krupa, Opp. Kannada Bhavan , Main Road, SVP Circle, Kalaburgi- 585102. 1st floor, Virupakshakrupa, Opposite KIMS main gate, R. Bb Road, Vidyanagar, Hubli - 580 021. 2nd floor, Essel Centre, MG Road, Mangaluru - 575 003. 2nd floor, Mysore Trade Centre, Opposite K.S.R.T.C. Bus stand, B. N. Road, Mysore – 570 001. Chairsmac, Ground Floor, 6 / 845 YMCA Road, Calicut – 673 001. 2nd Floor, Chicago Plaza, Rajaji Road, Near to K.S.R.T.C. Bus Stand, Cochin-682 035. 1st floor, KVR Tower, South Bazar, Kannur - 670 002. 5th floor, Bishop Jerome Nagar, Chinnakada, Kollam - 691 001. 2nd floor, Safa trading centre, Railway station road, Kottayam – 686 001. 2nd floor, Kanakath Tower, West Fort Road, Near Fort Palace Hotel, Palakkad – 678 001. 20/457/6, 2nd floor, Global centre, M G Road, Thrissur - 680 004. 3rd floor, Malankara Avenue, MG Road, Pattom, Trivandrum – 695 004. 2nd floor, VnV Plaza, Building No.6, M P Nagar, Zone No.2, Bhopal - 462 001. D M Tower, Flat No. 205-206, 2nd Floor, New Palaysia Road, Indore - 452 001. Hanif Tower, 1640, Napier Town, Mission Compound Road, Jabalpur - 482 001. 1st Floor, Sai Icon, S.No.95/3, Opposite to Axis Bank, Savedi Road, Ahmednagar - 414 001. 1st Floor, Renuka Commercial Complex, Nirala Bazar, Nageshwar Wadi, Aurangabad – 431 001. 1st Floor, Plot No.31, Landmark business Center, Lokmanya Hsg soc., Ring road, Jalgaon - 425 001. 1st floor, "The gemstone", 517/2, New Shahpuri, Near Central Bus stand, Kolhapur -416 001. D-301, 3rd Floor, Eastern Business District (Magnet Mall), LBS Marg, Bhandup (West). Mumbai – 400 078. 1st Floor, Block No.2, Bhoomi Saraswathi, Ganjawala Lane, Borivali (W), Mumbai – 400 092. 6th floor, leela Business Park, Andheri Kurla Road, Andheri (E), Mumbai - 400 059. 201, Marathon Innova, 2nd floor, Opposite to Peninsula Corporate Park, Lower Parel, Mumbai - 400 013. 7 Apsara, 1st Floor, S V Road, Santacruz - W, Mumbai – 400 054. 5th Floor, Shriram Tower, Next to NIT Building, Kingsway, Sadar, Nagpur – 440 001. 1st Floor, Pooja Enclave, College Road, Nasik -422 005. 211, 2nd Floor, Arenja Corner, Sector 17, Vashi, Navi Mumbai – 400 705. 2nd Floor, Sai Towers, Ambadi Road, Vasai (West) – 401 202. Onyx , 4th Floor, North Main Road, Next to Westin Hotel, Koregaon Park, Pune – 411 001. 1st Floor, Kanale Plaza, 82 Railway Lines, Duffrain Chowk, Solapur - 413 001. 1st Floor, Regency Royale, Opposite to Ganapati Mandir, Lal Chowki, Agra Road, Kalyan, Thane, Pin code - 421 301. 4th Floor, Lake city mall - A, Kapurbavadi Junction, Majiwada Naka, Thane - 400 607. 1st flr, Subham Sai Arcade, Khalasahi(in front of Trekker stand, Berhampur-760001. 3rd floor, Hotel Pal Regency Pvt. Ltd. , J 7, Jayadev Vihar, On Jaideb Behar, Bhubaneshwar -751 013. OSL Automobiles Pvt. Ltd., OSL tower, 2nd Floor, Badambari, Cuttack – 753 012. 1st floor, Prajapati Bhavan, Main Road, Rourkela - 769 001. 2nd Floor, Platinum Chamber, Budharaja Marg, Sambalpur – 768 004. Pondicherry Pondicherry 1st floor, No.23, City Towers, Gayathri Nagar, 100 ft. road, Pondicherry - 605 004. 3rd Floor, Nagpal Tower-1, SCO –128, Ranjit Avenue, Amritsar – 143 001. SCO 124-125, Sector 8, Madhya Marg, Chandigarh – 160 008. 3rd Floor, Eminent Mall, 261, Lajpat Nagar, Near Guru Nanak Mission Chowk, Jalandhar – 144 001. 5th Floor, Surya Tower, 88 Mall Road, Ludhiana - 141 001. 1st floor, SCO - 11, Choti Barandari, Patiala - 147 001. 4th Floor, KC Complex, Plot No. 711/4, Daulat Baug, Ajmer - 305 001. Office No.2, 3rd Floor, C-98, Sanghi Upsana Tower, Subhash Marg,C-scheme, Jaipur - 302 001. 1st Floor, N.K.Tower, Plot No. 49, Choupasani Road, Jodhpur – 342 006. 2nd floor, Kalptaru Building, Vigyan Nagar, National Highway, Kota -324 005. 2nd floor, Centre Point, Opposite to B. N. College, Airport Road , Udaipur – 313 001. RR Towers II, 2nd Floor, 94/95, TVK Industrial Estate, Guindy, Chennai – 600 032. 4th Floor, Rajanarayanan Towers, 70, Race Course Road, Coimbatore - 641 018. 248B, B-1, C,C-1, Rekha Towers, Kamarajar Salai Road, Madurai – 625 009. No. 82, Third floor, Kalluveettil center, Court road, Nagercoil- 629001. 356/1, Empire arcade, Omalur Main road, Opposite to new bus stand, Salem – 636 004. Vishodhan Towers, Ground Floor, House No. 1718, Vishodhan Towers, West Main Street Tanjavur – 613009. Shop No. G3, G4 part, Rearside, No.111, Achutha, Bharatidasan Salai, Cantonment, Tiruchirappalli - 620 001. 3rd floor, Thiripura Arcade, No. 75 A, Trivandrum High Road, Palyamkottai Tirunelveli- 627 002. 1st Floor, No. 41, Thaimanavar Street, Thirunagar, Vellore 632 006. No.6-3-346/1, 2nd Floor, Above Chills restaurant, Opposite to Jalagam Vengal Rao Park, Road No.1, Banjara Hills, Hyderabad, 500 034. 4th Floor, Office No.401 and 402, Kuchkulla House, Above Wills Lifestyle show room, Himayat Nagar, Hyderabad - 500 029. Yaikunta complex, H.No:3-1-836, CVRN Road, Karimnagar -505001. 3rd Floor, S V S Legend, 15-1-422/A&B, SVP Main Road, Warangal – 506 001. 2nd floor, Ajanta Plaza, MG Road, Agra – 282 002. 2nd floor, 116, Civil Lines, ICICI Bank bldg., Bareilly – 243 001. 1st floor, D-1, MG Tower, RDC Raj Nagar, Ghaziabad, Uttar Pradesh - 201 001. Flat No. 413, 414, 415, 416, 4th Floor, Mega Mall, Narona Crossing, Mall Road, Kanpur - 208 001. Ratan Square, 20A, Vidhan Sabha Marg, Lucknow – 226 001. Unit No.107, 108, 109, 1st floor, Shriram Plaza, Mangal Panday Nagar, Opposite to SBI Zonal Office, Garh Road, Meerut – 250 004. N22 (2nd floor) Sector 18, Noida-201 301. 5th Floor, Tower 1, Stellar IT Park, C-25, Sector-62, Noida 201 301. Uttaranchal Dehradun 3rd Floor, NCR Plaza, 24A Cantt Road, Dehradun -248 001. 4th Floor, City Plaza, City Centre, Durgapur – 713 216. 2nd flr, Atwal Real Estate, MS Tower - 2 building, OT Road Inda, Kharagpur, West Bengal – 721305. 4th Floor, Block- C, 22 Camac Street, Kolkata 700 016. 2nd & 3rd Floor, P-255B, CIT Road, Scheme-VIM, Kankurgachi, Kolkata – 700 054. 1st Floor, Sona Complex, 3rd Mile,Sevoke Road, Siliguri – 734 008. The issue will typically be resolved within 10 days. In case more time is required, the customer service department will inform the complainant of the same. In case the same is not done or the customer is not satisfied with the solution, the issue can be escalated further. To escalate the matter, write to grievance@hdfcergo.com or submit the complaint online on the official website of the page. At this level, the issue will be resolved within 15 days. In case the issue is still unresolved, write to cgo@hdfcergo.com. If the solution provided is still not satisfactory, contact the insurance ombudsman of your region.